I thoroughly enjoying reading and talking about books like What He Must Be: ...If He Wants to Marry My Daughter because these types of books demand that you think and give an answer for your thoughts/beliefs. This isn't something you can read and then just gently put aside thinking, "That was nice." Neither can you just saying, "I didn't like it" without explaining why. I think people should be reading more of these types of books, even if they don't necessarily think that they'll agree with them. It just makes you think and sometimes it's a good idea to clear the cobwebs and think fresh. Baucham certainly would urge you to. For the sake of argument, I'm going to divide how people view dating into two extreme categories. There are the Conservatives who strain towards arranged marriages without admitting it and then there are those who are more Liberal and suggest that they can't do or say anything about who their children marry and so "whatever." One camp suggests overkill in the matchmaking department and the other side argues the hands-off approach. I'll be honest. I lean towards the conservative camp so I didn't really have (very many) problems with this book. In fact, the only problem I had with it was that I didn't agree 100% on everything he said, but Baucham wrote the book to say that he was 100% correct and left no room for discussion. (Then he'd probably say that if I feel like I wanted to discuss something he would stand ready to prove me wrong.) I struggle with this type of writing style because that's my own personality. "Oh. You differ with me? Well, if anything within you suggests that you might have an opposing opinion then you are automatically wrong about whatever it is and should adapt your views to match mine so that we can all get along." Now, I'm not saying that Baucham says, "You have to agree with me or I won't like you very much." I AM saying that that is what his writing suggests and I feel qualified to point that out because that's frequently how I come across to others. "Oh, you. disagree. do. you? Want to think again?" That is something I have worked really hard at curbing. I need a new approach. Now that that's out of the way - let's look at what he has to say, shall we? He's not advocating arranged marriages. He does not approve of the hands-off method of dating in which the young are permitted liberties and freedom their great grandparents honestly would have never dreamed of possessing. As he notes, the modern way of dating has evolved over the course of the past 100 years and in light of history, that's a rapid change from the past "norms" of how budding, romantic relationships were handled. We've "progressed" from having parents involved in getting to know our children's suitors to handing over all the parenting reigns to our children. Baucham says that parents (fathers in particular) should absolutely be involved in deciding who should even be allowed past the gate when it comes to their daughters. Parents (Fathers) should raise their daughters in such a way that the daughters don't feel manipulated and managed when it comes to choosing their mates. In other words, parents need a multi-generational vision when it comes to "selecting" the man who their daughter will marry and it all starts with the Father himself. Fathering is an art of protecting, guiding, leading and loving. When a daughter sees what a man CAN be (through her father) she is going to look for someone who be all that to her and more when she marries! He advocates setting her expectations high with a good example! That's the crux of his argument and I wholeheartedly agree with it. 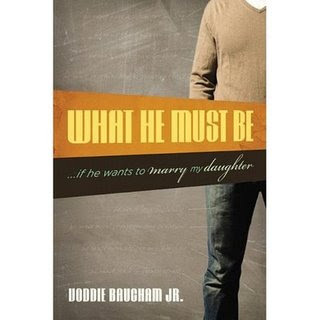 Boys learn from their father how to be godly, honorable young men. They learn how to take on responsibilities, control their wills and emotions in preparation for loving one woman and giving her his all. Likewise, daughters learn from their fathers what to look for in terms of character AND contentment. Bauchman said it best when he said that we should set up expectations in daughters to wait for and marry the very best. If young girls expect the best and are content to wait for it, then the chances of you having to worry that they are going to fall for "the wrong guy" are much, much slimmer. In all of this, I cannot object. When Baucham says, "Build expectations" in your daughters, that is an argument that really resonates with me because it's exactly what happened to me. And you know what else happened to me? I married the man of my dreams. No joke. He was absolutely everything on the "list" and then some (because God dreams bigger than even I do). My husband is a man that meets the qualifications of this book. Now, my parents and I did not live in the same state when I met Jonathan. I can also declare to you that I didn't need them there to see that Jonathan was a man of quality. I knew this from the way that I was raised and the expectations that had been set. There was no question and I still have no questions. I really did marry the man I gave my first kiss to. I married the first man I ever really loved - and knew that I loved. Expectations. Good training. I'm a relatively unscathed person and so I value books like these because they promote healthy hearts and a good foundations for multi-generational relationship blessings. Pure hearts, strong minds, true love. I cannot argue. Do I think the father needs to be present for every aspect of any beginning relationship? This is the only area where I differ with Baucham and I would say "no." I say this in part because I wasn't home but I was comfortable enough with who I was and what I believed to know where I would head with any romantic relationship. I think there comes a point in time where you have to trust the training of your children and know that you did right by them and before God. I am 100% satisfied with my own situation and I would only hope that my parents could be confident that they raised me well enough to know that when it came to choosing my husband for life, I would choose well. Again, the expectations for myself were high. That provided a huge source of comfort and confidence for me to know that I was TRUSTED enough to make a good call. And I did! With that in mind, I'd say train your children well. Set a good example. KNOW your children well. Are they confident? Have they proved themselves to be honest, true and devoted to their convictions? If so, the chances of you needing to worry about the future spouse should be slim. Now, every child is different and all have a different personality. I was the first born and have a disposition to match that. Not so with others. However, my brother also choose very well and Jonathan's brother (who is getting married TOMORROW!!) also choose very well. God is merciful and good and blesses those who love Him and follow after His will. Baucham is following after God with his whole heart and mind and I expect we'll see beautiful things of his family. He will reap the benefits and rewards of having trained his children well. I only hope to turn around and do the same with my children. And I expect I will. My expectations, again, are very high. Why are they high? Because I trust myself? No. I never have. I do trust in God and know I have a relationship with Him that I can count on. That supercedes everything else and gives me confidence to continue walking in faith, believing in and for the very best, both for myself, my children, and my children's children. I don't think that your getting married at the ripe old age (not) of 26 is all that unusual anymore. My sister was 32. I think the average age of girls getting married (for the first time...sadly enough we have to make such delineation) is higher than in years past, which goes to your point about not necessarily having the father's input in every aspect. Of course, Baucham may be assuming the girl will still be at home until she is married? Oh yeah, I meant to add: I enjoyed your thoughts on this book and I totally agree that its message is an important and critical one for today's youth, girls in particular. Quit settling and selling yourselves short! Wait and have high expectations! Yes! I really like Voddie Baucham, although I do find his ideas challenging at times. I really need to get this book since we have girls. However, my own experience pretty much matches yours, really, through no real planning on the part of my parents. I have a very reticent personality, and I had read enough books (i.e. LMM and others) to have REALLY high expectations. Then along comes dh--a true miracle in itself in terms of timing. He is EVERYTHING I was waiting for, truly. God's timing is perfect if we'll just wait. He was my first kiss, too! : ) We married when I was 25 and he was 24. Thank you, Lord, for protecting me from so much!!! Don't know if you remember that I reviewed this for 5M4B. I only had an excerpt available for the review, but what I read was good. Based on what I've read of Baucham's writing & blog, I haven't had issue with his message. But I haven't read this complete work (it's now in my stack). I think it's something we must consider very carefully as we raise our children. FINALLY a review of this book that is refreshingly honest, real, and thoughtful. I've got 6 years on your "ripe old age" but oh the joys of knowing and trusting God's timing and YAY!! for pure hearts, strong minds, and true love. Titles like this make me cringe. Having lived and worked in an extremely conservative environment where courtship was the thing, I watched parents use this line of logic to eliminate potential mates for their children who didn't "look right." Most of the judging was really based upon externals. The flip side to that was watching several women marry horrible, horrible men because they could say all the right things to dad. I like the idea of the dad being an example of that man. I think that has the biggest affect on women. But something in the title sounds like a typical controlling dad who exerts his authority rather than earning it. And leaves out any reference to the fact that the daughter is the one who gets to make the ultimate choice, and live with the consequences. Wise women seek the counsel of other godly men just like wise men seek the counsel of godly women when they are marrying. But the patriarchal movement turns women into spineless, naive, fragile creatures with no common sense and wisdom whatsoever. I haven't read the book. I would just like to see more titles that focus on dads (and moms) who love God and each other so passionately that their kids covet their guidance and counsel. Usually these parents (like mine) are so full of humility that they are really hesitant to do much but ask really good questions to help their child arrive at the right conclusions. After we were married we went out together, which was lovely! But as silly as it sounds I am a little disappointed that I never got to be picked up and taken out! I guess what it comes down to for me is this; Know your child, talk to them and prepare them, show them God's ways and they will not depart from them! Like you I have conservative leanings. I married at 22 and by God's grace only had a date with 3 other guys before going out with my husband. He is also my first kiss. I think I need this book just to help me see what to teach my boys. I'm sure I've got my work cut out for me! Beautiful post. I sounds like an interesting book, but not necessarily for me. Thanks for sharing.